This article was originally published at Intel's website. It is reprinted here with the permission of Intel. Nations that invest in Artificial Intelligence (AI) stand to gain tremendous advantages across industry, government and society at large. On February 11, 2019 the White House issued an Executive Order on Maintaining American Leadership in Artificial Intelligence1 (the Executive Order). The Executive Order is an important first step in acknowledging the importance of U.S. leadership in AI. It’s time for the U.S. to bet big on AI by building on the Executive Order to expand a National AI Strategy that includes specific measures to support and promote AI development and deployment. A comprehensive national AI strategy would earmark funding and resources for AI research and development, outline clear goals and accountability mechanisms, identify and remove barriers, drive public and private development and adoption of AI, and outline a program to mitigate negative or unintended consequences. A national strategy building on the aims of the Executive Order will facilitate and focus current U.S. efforts, paving the way for the future of AI. Sustainable and funded government AI research and development will help explore the seemingly endless capabilities for AI in areas such as healthcare, cybersecurity, national security and education. As AI is adopted, implementation of federal policies will be critical to help ensure the most effective and responsible use of AI, setting in place clear ethical frameworks to guide development, and educating the public for better understanding of the uses and benefits of this technology. Mandated adoption of AI systems throughout the government will enable the advancement of AI and serve as a convener of best practices among multiple stakeholders including academia, industry, and civil society. Positioned as a hub for information and skills sharing, the government can expand AI development and adoption through public-private collaboration and cross-sector partnerships. This will enable the U.S. to develop and deploy AI technology more quickly throughout the economy. The more data made available for use in AI, the more “intelligent” AI systems become. Increased access to reliable data, however, must be coupled with privacy protections and comprehensive ethical measures. The adoption of comprehensive federal privacy legislation, and policies that require accountability for ethical design and implementation, are critical to ensuring protections are in place for efficient data sharing practices that mitigate potential individual and societal harm. With these policy protections in place data sharing can be a benefit, not a burden. Increased access to government data sources in machine readable formats across borders and jurisdictions will provide AI practitioners with a wide variety of data to help train AI systems. The adoption of international data interoperability standards will help speed the development and adoption of AI systems, and increase the efficiency of data sharing processes. Government incentives to increase willingness and comfort with sharing information with the public and private sectors will help shift the mentality of data as a product, and encourage data sharing. The government can also increase the inclination to share data by investing in privacy-preserving AI research, which allows academic and industrial labs access to training data while protecting it from being reverse engineered. Understanding the potential impact of AI on the workforce is critical. A multifaceted effort is needed to put the U.S. on a fast track to ensure AI employment opportunities and upward mobility for U.S. citizens. Specifically, the government needs to invest in the development of a workforce that creates AI, cultivate a workforce that uses AI, and mitigate potential negative impacts of AI-caused employment displacement. To do this federal and local governments should conduct a comprehensive study of the impact that AI will have on the current and future workforce. Utilizing the study’s findings, government, in collaboration with industry, can implement targeted initiatives and programs to help develop the workforce and alleviate job transitions and loss. A skilled and competent workforce has always been the foundation of the U.S. technology industry, enabling the economy to adjust to disruptions. However, an AI economy will require a new approach to our nation’s education system. This approach includes an overhaul of the educational curriculum to focus on critical thinking and complex problem-solving skills. Dedicated federal funding for grants, scholarships, and fellowships focused on building AI skillsets will also increase opportunities to develop and sustain an AI workforce. While preparing the next generation workforce is important, retraining the current workforce is equally so. The U.S. needs to make investments in AI skills development programs and support for workforce expansion. A successful national AI strategy requires an analysis of the existing regulatory and policy landscape to identify and remove any barriers to the development and adoption of AI, while legislation and policies that help promote the responsible and ethical development of AI should be advanced. To achieve protection and security, the government must act to ensure AI can flourish in a safe environment where government and industry work in tandem. Government should avoid requiring companies to transfer or provide access to technologies, source code, algorithms or encryption keys as conditions of doing business, and support the use of all available tools, including trade agreements and diplomacy, to achieve these ends. The U.S. faces a great opportunity with AI to increase global competitiveness, improve the quality of life for the citizenry, and maintain its leadership stance on the world stage. Fostering innovation and development of AI, encouraging responsible data sharing, creating employment opportunities, and easing regulatory hurdles will ensure a U.S. big bet on AI will pay off in multitudes. There is no doubt that AI, including machine learning and deep learning algorithms, as well as the hardware to accelerate them, is a transformative technology.2 AI is already providing profound capabilities and benefits that were not achievable just a few years ago.3 Looking to the future, AI has the potential to help us solve some of humanity’s biggest challenges. A 2017 report by PWC estimated that AI technologies could increase global GDP by $15.7 trillion by 2030, representing a potential 20% increase, with $3.7 trillion of that increase happening in North America.4 Many countries, in an effort to be the first to reap the benefits of AI and lead the AI revolution, have published AI national strategies and committed significant resources to the development and deployment of AI.5 In the U.S., the technology sector has long been a driver of global economic growth, bolstered by the U.S.’s unique approach to public-private partnerships. When technology development has been coupled with limited regulation and meaningful citizen-focused protections, the U.S. has been an innovation-rich environment unmatched in the world. However, relying exclusively on private sector innovation, while successful in past efforts, may not enable the U.S. to continue leading in AI as it has with prior technologies. To successfully lead in AI, the U.S. needs a comprehensive view of the national AI ecosystem and coordination across academia, industry, and civil society. As the potential societal and economic benefits and risks of AI are becoming clear, other nations are seeking to lead in AI by publishing comprehensive AI Strategies. These strategies commit funds and resources to the national development and adoption of AI, and the creation of domestic AI industries. In 2017, China’s State Council issued a comprehensive plan to build a domestic AI industry forecasted to be roughly $150 billion by 2030 (plus related industries valued at nearly $1.5 trillion).6 In 2017 alone, China’s AI industry received nearly 180 billion yuan ($26B USD) of investment and financing.7 AI-related patent submissions in China almost tripled between 2010 and 2014 compared with the previous five years, and Chinese investments account for 48 percent of global AI startup funding,8 while South Korea recently announced a roughly $900 million investment in AI over five years.9 This shows that government is in a unique position to advance the development and deployment of AI through leveraging existing expertise within the government and funding commitments. Fostering innovation through investment in research and development. Creating new employment opportunities and protecting people’s welfare. Responsibly liberating data to accelerate the development of AI systems. Removing legal and policy barriers to enable development and implementation of AI. 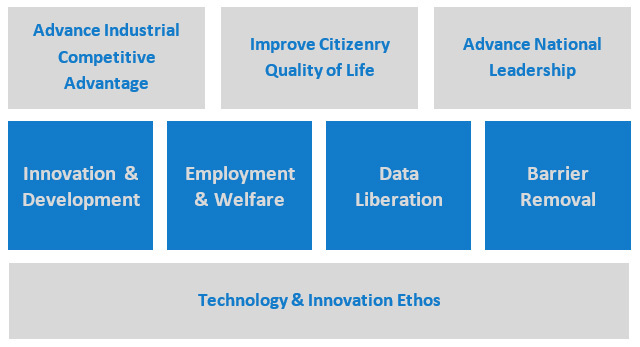 The following sections define the four key pillars of Intel’s recommended National AI Strategy. This framework will allow the U.S. to reap the benefits of advancing its industrial competitiveness, and promoting the U.S.’s AI leadership across all relevant areas (e.g. academia, industry, health care, government operations, cyber-defense, etc.). Increase Funding for AI Research and Development. While the Executive Order calls for increased research and development on AI, it does not make specific funding commitments critically needed funding and resources. One of the first areas of funding should be a study to determine where best to invest in research and development for the advancement of AI. Areas such as healthcare, national security, cyber-defense, data analytics, fraud detection, robotics, human augmentation, and AI for good initiatives (e.g., climate change, education, and sustainability, etc.) are particularly suited to the impactful deployment of AI. Government should also invest in fundamental research on future potential uses and implementations of AI.Additional funding should also be allocated to government agencies that support fundamental research and innovation in AI such as the National Science Foundation, the National Institute of Standards and Technology, the Defense Advanced Research Projects Agency, and others. Legislation is also needed to direct and fund government agencies’ study of how and where to most effectively adopt AI solutions within government. Mandate Adoption of AI Systems throughout the Government. Any U.S. AI policy should enable procurement and deployment of AI software and services throughout the U.S. Government including state and local governments, and funding studies to determine how to optimize existing systems for AI applications. For particularly sensitive applications, governments should ensure algorithmic accountability (i.e., responsibility measures and mechanisms for redress for potentially harmful results), explainability, appropriately narrow export controls, and mitigation of harmful bias. This includes enabling research and serving as a convener to leverage and share best practices among multiple stakeholders, including academia, industry, and civil society. Develop Responsible Government Policies for AI. To ensure the most effective and responsible use of this investment, the U.S. should develop and communicate thoughtful and ethical government policies and guidelines. This in turn will inform the development of international norms. Clear ethical frameworks will help the government’s efforts to engage private sector AI leaders by delineating the government’s objectives and guardrails around the use of AI and autonomous systems. Numerous groups from the public sector, civil society, academia, and the private sector have released various guidelines around the ethical design and implementation of technology.13 The U.S. should work with the private sector and academics to develop these guidelines. Government investment and research can support this work. Encourage Private Development and Adoption of AI. The U.S. should research tools and programs to encourage private development and adoption of AI throughout the economy. Initiatives on public-private collaboration and cross-sector partnerships will allow for quick development and deployment of AI technology. This will also encourage the evolution of AI systems that address government needs and challenges. Promote Awareness and Understanding of AI. The U.S. should develop policies and programs that foster public understanding and awareness of both the benefits and limitations of AI. If the U.S. is to be the AI innovation leader, U.S. citizens must understand the value and benefits of this technology. The more the technology is understood and embraced, the quicker it will be adopted, and the sooner the benefits will be realized. Support International Cooperation and Standards. The U.S. should coordinate with other nations and the private sector to facilitate cross-border data sharing and intellectual property protection. International standards, such as data interoperability standards, should be leveraged to speed the development and adoption of AI applications. A 2016 McKinsey Global Institute report found that 45 percent of work activities could potentially be automated by currently demonstrated technology, and machine learning, a subset of AI, might enable automation of up to 80 percent of those activities.14 Workforce disruptions are not a new phenomenon, especially in the face of productivity enhancing technology innovations. Research is needed to show how the economy and labor market will be affected by increased AI adoption. Currently, most deployed AI technologies are classified as “augmented intelligence,” meaning that they are designed to perform a specific task and assist human users, rather than replace human workers.15 This means that in most cases only a portion of a job would be replaced or made more efficient by the introduction of AI into that function. Nevertheless, most experts agree that there will be a substantial disruption to certain segments of the workforce, particularly for those in lower knowledge based positions and those located in less economically advanced areas of the country. Invest in the development of a workforce that creates AI. Cultivate a workforce that uses AI. Mitigate the potential negative impacts of AI-caused employment displacement. The following specific actions should be taken in each of these areas. Update Education Curriculum. Curriculums need to be updated to ensure that the next generation is equipped to enter the AI workforce. According to the World Economic Forum, the top five skills in 2020 will be: complex problem solving, critical thinking, creativity, people management, and coordination – skills that will be critical in the AI workforce.17An increase in government funding and investment in early childhood education, including teaching critical thinking, will strengthen the complementary relationship between humans and machines. Beyond early childhood education, primary schools should shift away from educational models that emphasize repetition, replication and memorization. Curriculum should be reviewed and studied to ensure that students are provided with the training needed to participate in the AI economy, with a focus on diverse and underrepresented students. High schools should offer programs and curriculums relevant to the AI job market. Bolster Investment in Higher Education at All Levels. The government should establish more institutional grants, scholarships, and fellowships to create curriculums that build AI skills in mathematics, statistics, computer science, data science and electrical engineering. Government should cooperate with industry to create incentive programs for people with traditionally disproportionately limited opportunities in AI and technology fields (i.e., specific scholarships and grants for women and minorities). Cultivate a workforce that uses AI. Along with investments in education, the U.S. will need more AI-focused programs dedicated to skills retraining and support of workforce expansion to help mitigate the potential negative impacts of AI on the workforce. Again, such programs should reflect and encourage a diversity of experience, thought, skills and education. Federal programs and public-private partnerships should be established to support the introduction of AI technology and training programs. This could be done in community college programs that are separate and apart from funding and programs that may be made available for four-year institutions. For example, technical curriculums should be established that prepare workers to use AI technology in traditionally non-tech industries that will benefit from the AI revolution. Support Unemployment Insurance and Benefits. Government, collaborating with industry, could provide unemployment insurance in the form of benefits for individuals whose jobs have been directly replaced or reduced by AI. Data exists in support of unemployment insurance in these situations, but more studies are needed to accurately measure if current types of unemployment insurance will provide enough transition assistance and whether existing benefits provide enough support to maintain the stability of the economy.18 In the meantime, one method for providing support could be strengthening federal grant funding to states for traditional safety net programs like Temporary Assistance for Needy Families (TANF) to provide family support and stimulate job preparation, and the Supplemental Nutrition Assistance Program (SNAP) for individuals experiencing food insecurity. Establish a National Service. Jobs are more than a source of income; they also provide a sense of dignity and value beyond that gained from wages and benefits. A study of the degree to which a broad-based public-private partnership network of National Service opportunities could alleviate job loss would provide more insight on this topic. Of additional interest could be a study on the degree to which such a program could also be used to rebuild infrastructure while developing technology skills, such as a public-private partnership funded Works Progress Administration that requires all projects to meet certain goals around both human employment and the use of data and technology to assist those employees. Developing AI systems requires vast amounts of data that is used to identify patterns, extract insights, and ultimately train a system that can act intelligently in the target domain. Generally speaking, the more data available, the more “intelligent” an AI system can become. Furthermore, adding data to these systems over time enhances their ability to understand new situations and opportunities as data generation and collection continues to build. Therefore, it is imperative that data be made broadly available in a usable format. Nations that promote open data sources and data sharing are the ones most likely to see rapid advancements in AI capability. The following specific actions should be taken to liberate data in a responsible manner. Open Government Data. The U.S. government is leading by example and increasing access to government sources of data as appropriate. This ensures that publicly available data is shared in machine readable formats and across borders. State and local governments should also consider making non-sensitive or anonymized data available for use in AI systems. Incentivize Data Sharing. Foster incentives for data sharing between public and private sectors, and among industry players. Often data is viewed as a product or commodity with aggregators reluctant to share or make data available. Governments can incentivize sharing through tax or policy incentives. In addition, the U.S. government should seek to prohibit the imposition of tariffs on data flows around the world. Similar to the efforts made in the cybersecurity space for sharing threat information, data appropriately shared would increase data availability and accelerate the development of AI solutions. Adopt International Interoperability Standards. International data interoperability standards should be adopted to speed the development and adoption of AI systems.22 Certain data have already been made available in standardized formats and are therefore available to AI systems. For example, the National Cancer Institute pioneered a data-sharing protocol whereby certified researchers can query de-identified patient data drawn from clinical data, claims information, and drug therapies. This enables AI researchers to evaluate efficacy and effectiveness and make recommendations regarding the best medical approaches without compromising patient privacy.Government should actively support the creation of reliable annotated datasets (i.e., uncorrupted, valid, and relevant) that could be used by all AI developers, by start-ups, and more broadly by industry to validate automated solutions, benchmark algorithm outcomes, and test for unintentional biases. Invest in Privacy-Preserving AI Research. Research should be accelerated in academic and industrial labs on methods for training AI algorithms on datasets without requiring direct access to the training data. For example, federal learning approaches allow for training on edge devices without sending the original data to the cloud. Homomorphic encryption enables training models directly on encrypted data. Differential privacy methods protect the training data from being reverse engineered. Policymakers should prioritize having organizations such as the National Science Foundation and Defense Advanced Research Agency fund such research. In addition, when the U.S. government is deploying deep learning methods, that privacy research should be leveraged to set an example for industry. Require Accountability for Ethical Design and Implementation. The social implications of computing have grown and will continue to expand as more people have access to smart systems. One of the most significant implications for end users of AI systems is that data sets used to train such systems are biased and can invisibly and unintentionally reproduce and normalize theses biases.23 Policies should work to identify and mitigate discrimination and bias in algorithms and encourage diversity in design and data sets. In addition, existing statutes governing discrimination in the physical economy should be extended to their complementary digital platforms. Government should evaluate the existing regulatory and policy landscape for barriers to AI adoption, and use caution before adopting new laws, regulations, taxes or controls that may inadvertently or unnecessarily impede the responsible development and use of AI. New policies should be established to appropriately govern the use of AI, accounting for the unique aspects of AI. The primary considerations from a policy perspective follow. Protect U.S. Innovation and IP Globally. For innovative technology to be developed and implemented there must be IP protections for source code, proprietary algorithms and other innovations.26 Government should avoid requiring companies to transfer or provide access to technologies, source code, algorithms or encryption keys as conditions of doing business, and support the use of all available tools, including trade agreements and diplomacy, to achieve these ends. The U.S. has a great opportunity with AI to increase its industrial competitiveness, improve the population’s quality of life, and maintain its leadership stance on the world stage. Through the recently released Executive Order the Administration has signaled its willingness to act to maintain U.S. leadership on AI. Now it’s time to move forward or risk falling behind other nations who have already developed AI strategies and are investing heavily to capture AI’s enormous potential. Intel would welcome the opportunity to discuss our recommendations. We stand ready to work closely with all interested stakeholders to develop viable pathways to pursue the responsible development and adoption of AI to ensure U.S. leadership in this emerging technology. 3 Examples abound in such broadly ranging market segments as Health Care (e.g., more precisely detecting and diagnosing certain forms of cancer, treating depression), Food Production (e.g., improving crop yields), Energy Production and Distribution, Industrial Applications (e.g., increasing supply chain efficiencies), and Financial Markets (e.g., protecting our financial systems). 4 “Sizing the prize: What is real value of AI for your business and how can you capitalize?” PriceWaterhouseCooper, 2017. 14“The Age of Analytics: Competing in a Data-Driven World.” McKinsey Global Institute. December 2016. 17 “The top 10 Skills that Will Land You a High-Paying Jobs by 2020, According to the World Economic Forum” by Melanie Curtin. 21 “With big data collected in ways that people do not know, we need to rethink privacy.” The Hill. 7/9 2018. David Hoffman. 22 “How Artificial Intelligence is transforming the World.” Brookings. April 24, 2018. 23 “Augmented intelligence in health care: Report 41 of the AMA Board of Trustees,” American Medical Association 2018. 24 “How artificial intelligence is transforming the world” Brookings, April 24, 2018. 25 “How to regulate Artificial Intelligence.” Oren Etzioni. New York Times. September 1, 2017.